Touring Tucson is unexpected! 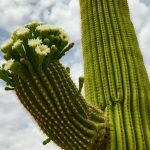 From palm trees and oleander to saguaro cactus and 117 degree days! We loved Tucson! It is tucked into a valley surrounded by mountains that are breathtaking with restored mansions in the El Presidio Historic District and the adobe row houses of the Barrio Historico. The University of Arizona looms large with shops, eateries and lots of action! We started in The Saguaro National Parks (both west and east sides). The dirt roads and saguaro cacti standing at attention like a large army is so different than what we have ever seen before! 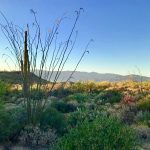 We wandered up and down the hills in the western Saguaro National Park, photographing the surrounding mountains and the many colors of the desert plant life. We found the western side of the Park more interesting than the eastern side. The drive to reach the western side is beautiful too as you wind around hills and valleys filled with saguaro. Saguaro only grow an inch per year, the saguaro here are huge! We stopped at the Desert Museum to see the wildlife. We were there as photographers and were a bit disappointed with the cost of admission and lack of photographic opportunities. We arrived around 11 a.m. and that may be the reason so many animals were in hiding or sleeping already in the Tucson heat. The hummingbird aviary was why we decided to visit but there seemed to be few birds the day we were there. There is a pool with stingrays at the Desert Museum that we loved. Their stingers have been removed and they are so curious they cruise right up so you can pet them! One big fella called “George” flipped salt water on Stu as he glided by! Old Tucson was next on our list but we found it closed during weekdays. If you’re in the mood for shoot-outs and can-can girls, this is the place for you! We spent an entire day driving up Mount Lemmon, where the temperature is approximately 30 degrees cooler than the temperature in Tucson. Located in the Santa Catalina Range, Mount Lemmon is surrounded by the Coronado National Forest. Take this backroads trip and you drive the 27-mile Sky Islands Scenic Byway, which is beautiful! Valley view from Mount Lemmon. Start in desert with saguaro cactus and climb past hoo-doos and balancing rocks to Ponderosa Pine and views that go on forever! Mount Lemmon is a perfect place to hike trails, camp, fish, do some birdwatching or ski in the winter. The town of Summerhaven is delightful with a General Store for an ice cream treat. Lunch is fantastic at the Sawmill Run Restaurant where an outside terrace looks out over the mountains. Sitting under a terrace umbrella, we found the food really good! We photographed each stage of the Mount Lemmon trip and stayed up top for some birdwatching! One very hot day, we took the tram up Sabino Canyon. Once again, the terrain seemed different from everywhere else. For $10, a tram takes you to the top and will drop you at any number of scenic stops. Wildlife in the canyon includes deer, javelina, skunks, tortoises, rattlesnakes and mountain lions. Take more drinking water than you think you will need! The heat is so dry that you will dehydrate quickly! Perhaps our favorite activity of all was heading to Sabino Canyon each evening to photograph sunsets. The skies and views never disappointed! You’ll meet local residents taking their daily constitutionals and jogging up the canyon. The food in Tucson is amazing! See our post, Foodies Take Note! We enjoyed a different restaurant each night and you can find fantastic food to meet every budget. We’ve discussed some of our favorites elsewhere in this blog. We’d be remiss if we didn’t tell you about sitting outside at Starbucks in the morning, enjoying the refreshing mountain views. Try the icee-type drinks at Eegee’s! The Mango Tango will send your tastebuds into ecstasy! Tucson is great for exploring-from the well-planned downtown, to the University, to expensive neighborhoods and small homes, it is a fantastic city with charm galore! If you have never been to Tucson, a wonderful time awaits! Share your favorite spots in Tucson with us in the comment section! We will be going back and want to learn from you. Thanks!